Back in my days before sabbatical, I was responsible each week for a post about Timbers player evaluations. The original thought behind this was to drive thoughtful comments and discussion about player performance and thus have people visit the site regularly. Admittedly, it worked for a long time, especially when my scoring system was rather harsh in the beginning. I can look back on previous years of evaluations and determined that I made it nearly impossible to score a perfect 10, yet I gave several players a 1 for completely imploding. As I put many times in responses to interested parties, I'm only going off the observations from the match in general and I did my best to confine thoughts to a specific player and match, but that often proved difficult. As much as soccer has tried to put analysis and statistics together in a way that makes sense, Bruce Arena was more right than he realized in his smug way (my judgement) that the only stat that matters in soccer is the score. In the nearly 10 years I've covered Portland in one capacity or another, I can point to dozens of matches where the numbers would show pure dominance with the exception of the score. Possession, passing completion, shots on goal, turnovers - those are all great numbers for a team to show a plan is working to create chances for a side, but it matters little if those chances don't create actual goals. 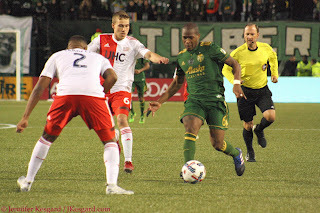 For me, the most recent match against New England seemed to emphasize this point - the Timbers led in many statistical categories and I thought the team played very well in the first 30 minutes or so to garner a lead, but Portland undid the great work and eventually conceded the leveling goal off a glaring mistake. That's part of the nature of soccer - one of its greatest attributes but also one of the cruelest - is that a single play, a minuscule bounce or a a missed tackle can be the difference between a positive and negative result. 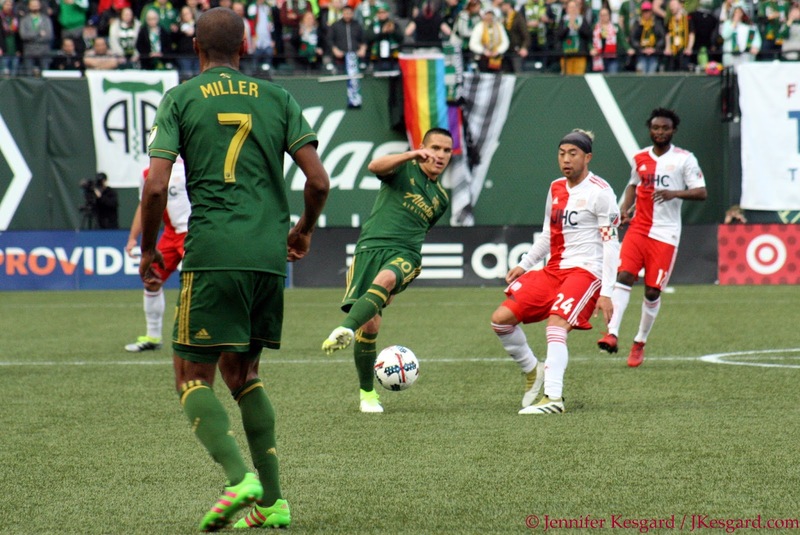 While I think that's true in other sports to an extent, it's more prevalent in soccer because of the limited scoring chances, and I feel this is a result that the Timbers will look at and rue giving up points later in the year. I'm not saying that to curse the team or throw unnecessary fire on the effort, but in a closely played match, the margin can be quite small and there's a ton of difference in earning 3 full points and gaining confidence at home versus earning 1 for a draw and then questioning the reason for the breakdown. My attempt in this segment and for future Wednesday analysis is to provide 3 things I liked about the Timbers' most recent match, 3 areas for improvement and quick evaluations for those that appeared in the match. Using the 5 point rule as a 5 player does his job on an average basis with nothing bad happening but nothing extraordinary either, I go on the 10 point scale from epicness to dumpster fire of ineptitude. I don't want to belabor performances in other matches either, unless I see a trend that is arching up or down accordingly, the scores are based upon my observations. While I've been at this for many years, I do realize that others will notice things and point them out, and I'm great with discussions as long as they are kept courteous, insightful and with backing facts or opinions to support the case. Three Things I Liked: (1) Sebastian Blanco is my new favorite Timbers player. 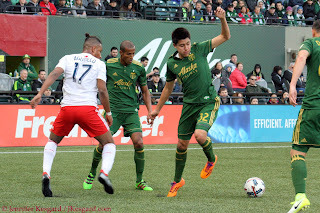 I saw glimpses of what Blanco could add to the offense with his vision and pace during the Timbers preseason matches, but we didn't get a great extended look at Sebastian until the MLS season started. His ability to stay wide and force teams to defend the width of the pitch is impressive, but Blanco has been extremely steady at tracking back to aid his defense regularly. When the midfield wing can track back and help the defensive line and not get in the way, it's a huge asset for a team and Blanco excels at this. (2) Marco Farfan will make Caleb Porter's job very difficult soon, if not already. At 18 years old, I was mostly worried about completing homework, trying to find dates and contemplating my future in college, not chasing around professional athletes for a living. Farfan is still completing his senior year at Centennial High School, but with Vytas injured and Zarek Valentin struggling slightly, the youngster has played 2 matches in defense and not looked out of place in either affair. For an organization that has struggled to find home grown talent and play them regularly, this is a huge win for Farfan and what T2 is doing for the whole organization. (3) Diego Valeri is playing on a completely different level from everyone else. We are witnessing one of the greats in MLS at the peak of his talent, and I couldn't be happier for him or the team at this point. Three Things I Didn't Like: (1) Where was Darlington Nagbe? I love Nagbe's game because there are few players that came move from box to box so fluidly and quickly with a soccer ball at their feet than him. But I also feel like he disappears at times, and we saw this version for most of the second half. I am not sure if this was due to being tired (2 home matches in a row with no subs), but it was a troubling trend (2) Why no subs? I've heard over and over about our improved depth and strength in the roster, and we've seen it to fill our side due to injury or absences before the match starts, but for 2 matches in a row, we played our starting 11 for the full match. I get this for Houston somewhat because everything was clicking, but when we were struggling for energy versus the Revs, perhaps a sub might have helped. (3) What Are You Doing, Jake? As a shot blocking goalkeeper, Jake Gleeson is one of the best keepers in MLS bar none. As for the other skills needed to be a top flight goalkeeper, Jake is middling at best. Versus the Crew, he made several questionable decisions to leave his line that contributed to goals for the other side, and the goal for New England was conceded when he failed to catch a shot or block it away from the middle of the goal. I get that the defense didn't help him at points, but at the same time, our keeper needs to be better in those situations. Jake Gleeson - 3: Made several good blocks and punches at points, but distribution was spotty and spilling a ball in front of goal cost the team big time. Marco Farfan - 9: My man of the match, Marco routinely kept Revolution forward Kei Kamara occupied while moving forward to help the offense. I'm still flabbergasted he's only 18 and hanging with MLS caliber players like it's nothing. Lawrence Olum - 5: Did his job reasonably well without too many glaring errors. Roy Miller - 5: I would like to mark him up for some offensive support, but it would be cancelled out by some marking errors and questionable positioning at points. Alvas Powell - 6. If Alvas could even learn to put a cross in a good spot regularly, his career would skyrocket. Instead, we have a player that makes mistakes but covers them up with recovery speed. Diego Chara - 4: While I talked about Nagbe being MIA, I thought you could say the same for Chara as well. I didn't notice his influence as much in this match, whether that was due to the Revs neutralizing him or Chara just being out of position, but he was more effective at certain points. David Guzman 6: I liked his game and it would have been awesome for him to net another goal, but I did feel his effectiveness wasn't as good as we've seen in previous matches. Perhaps it was rushed passes or the midweek return after international play, but I thought we saw Guzman at about 70 percent. Still good, but not enough to completely control the midfield. Darlington Nagbe - 3: See above. Diego Valeri - 8: His goal was amazing, and he created lots of chances with creativity and pace. We are seeing greatness each time he takes to the pitch, and I'm just waiting to see what more he can do for this team each week. Sebastian Blanco - 7: Did well for the limited chances that came his way, but did have issues linking passes to others, but I credit New England with influencing this as much as anything. Fanendo Adi - 4: Had his chances, but rushed more that a few shots on the day. A patient Adi is a dangerous Adi, and we like it when Fanendo is dangerous. New England - 7: They played feisty and physical with only getting 2 cautions. Nobody got hurt and they earned a point late off a sloppy play by the Timbers defense. What's not to like from a road match where you get points? 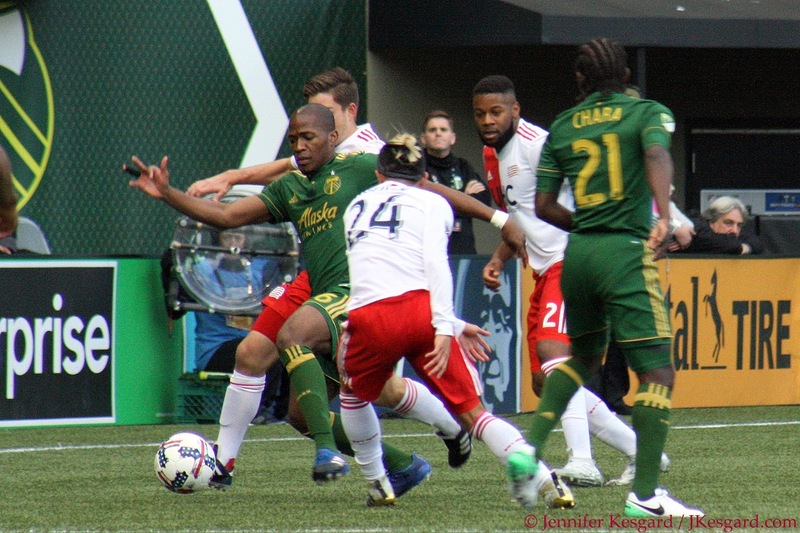 Timbers - 5: Offense was solid in the first half, passive in the second; defense was able to stay organized in the first, and then got out of sync in the second half. The draw was disappointing, but it was likely the most fair result for both sides. Snarktography - 10. The return of something really awesome? Okay!